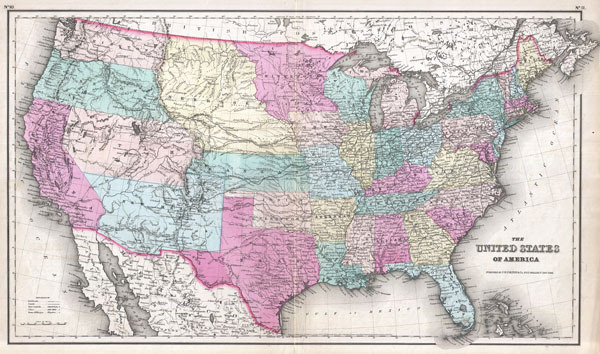 A beautiful example of Colton's 1857 map of the United States. Depicts a rare ephemeral statehood configuration - particularly in the western part of the country. Nebraska Territory extends from the Kansas border northwards as far as Canada. To its east, Minnesota territory includes much of what is today the Dakotas. Further west, Washington and Oregon extend inland from the Pacific as far inland as the Rocky Mountains. Likewise with Utah, which extends from California to Kansas. Further south the vast New Mexico Territory includes all of what is today New Mexico, Colorado, and Arizona. Several emigrant and explorer's routes are noted, including the Route to Santa Fe, Fremont's Route, Kearney's Route, and the Oregon Trail. Throughout, Colton identifies various cities, towns, forts, rivers, rapids, fords, and an assortment of additional topographical details. Map is hand colored in pink, green, yellow and blue pastels to define state and territorial boundaries. Surrounded by a simple line border that Colton introduced in 1857 and ran through 1859. Dated and copyrighted to J. H. Colton, 1855. Published from Colton's 172 William Street Office in New York City. Issued as page nos. 10 and 11 in George Washington Colton's 1857 Atlas of the World. Colton, G. W., Colton's Atlas of the World Illustrating Physical and Political Geography, New York, 1857. Very good condition. Minor wear along original centerfold. A couple of minor erased pencil marks. Text on Verso.